You created an exceptional version of this song, your voice is perfection and the band is excellent. Your garage door is much more colorful too. God, I can”t stop listening to this. It’s so tribal and mysterious. So visceral. And the band is great. I grew up with the original, but this big, baritone rendition is it for me. Fantastic. What about Trail of Broken Hearts or Pullin’ Back the Reins by k. d. lang? That would be interesting……..thanks P, oh, and Pickles anatomy class was fun! Hello …my name is Michael Holman and i have been hosting the Almost Blues Show in Melbourne Australia for nearly 23 years now and over the years I have heard some amazing voices and yours is up there with the best of them. For the last 10 years i have opened up every show with a different artists version of Hey Joe and would love to get a copy of you doing that classic. Also would love to interview you one day for the show and if your coming to Australia any time soon please let me know via your management and I would be more than happy to promote it over our show for you. Also could you please tell me the song that was used during your entrance to SF Regency Lodge where you sang an incredible version of Hallelujah. cheers and keep the fantastic music coming…you are a legend. i want a CD of puddles and mike, are you on xm ? Love this! Love you! That ending is striking. Tucson is beautiful, and so is your voice. They should be in the same place. Come to us and I will show you the rose of the Sonora Desert. 🙂 I’d love to see you play here. Love your voice, glad I found your web site, will visit often. May you continue to gift us with your talent. THANK YOU FOR KEEPING ME COMPANY ON PAINFILLED NIGHTS. JESUS COMFORTS ME & YOU MAKE ME LAUGH !!! BLESS YOU FOR SHARING YOUR GOD-GIVEN GIFTS. Ok, but why, please ? Why does he need to give you a reason? OMG I could listen to you for hours (already have!) Amazing voice and wonderful arrangements, entertaining videos you’ve got it all. Please, please come to Dallas Please! Protect and honour that god given talent u have. Wow “the sound of silence” was so touching, especially the end when you didn’t voice that last “sound of silence line”. Of course I did in my head but then looked at you and just realized your dramatic silence and Bam, I got it. What a genius you are in so many ways. Thank you for sharing. You made my day. This is without doubt, the best and only version of this song!! You knocked it out of the park. Keep singing!! Wow. There are no words that can describe how good your version of Sounds of Silence is. Wow. There are no words that can describe how good your version of Sound of Silence is. 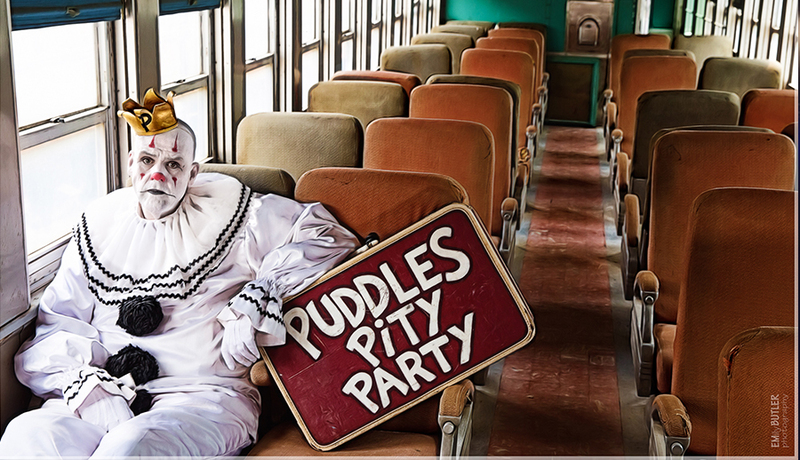 Dear Puddles: Can you do “Going, going, gone,” by Bob Dylan (or any other Dylan song you choose)? I hope that you will make mega millions $$$. All I ask is that you stay True to yourself. Wonderful. Your voice kills me. Such truth, such honesty. I’m in bits. A genius at work. Just put together a new sound system at home, and you are my go to reference music when I need to fill the room with greatness. Thanks you. Would love to hear a rendition of Where the Streets Have No Name. I am digitising my LP collection and now and then I hear something which I think would be a Hell of a great song for you…. I recognize there must be thousands of such requests, but still I think if you consider it the song would be a great way to show off your talent, range and emotional expression. How about a cover of “Blue Bayeux”? I think you’d knock our socks off with this one. Think about it and thanks, by the way, for giving us such great music. We don’t see such talent very often, so please try to avoid dying in a plane crash or overdosing… if you feel sad and unloved just get online and start a chat with anyone who has heard you sing. I’m sure they’d bring you up. Love you and your music, was really rooting for you on AGT, keep up the great music!! Love, Love, Love your music. I feel the love, and soul you put into your songs. Danny boy makes me tear up when I watch you sing with such emotion. You sing with your whole body and soul, and it’s wonderful to watch you perform. I’d love to hear you sing Some Where Over The Rainbow. Think about it. If you ever come to South Jersey to perform PLEASE appear at the Old and beauitful Pitman Theater in downtown Pitman NJ. They book a lot of really good shows there. Please stay well and keep on singing. You have a lot of fans who love you. One more thing, Please go on AMT and try again. Maybe they’ll get it right this time!!! Best wishes also to your crew. They make the music happen. Can you please do “Superman’s Song” by Brad Roberts and The Crash Test Dummies? P.S. It’s very sad and it hurts a lot to be a Crash Test Dummy. Not just a fine voice but as with other covers, an exceptional arrangement as well. This was always a great song, so I can’t say you’ve discovered or uncovered its greatness. But you sure have brought to it a remarkable interpretation. It reminds me of Johnny Cash’s version of Hurt, in which he takes the song into his soul. I may have listened to The Sound Of Silence for six hours this evening. I’m ready to start listening again tomorrow morning. How could I obtain a CD? Where can I buy this track? Please take my money! Great job, as always. I’ve been following your work since April of 2010 when you kissed me at the House of Blues in New Orleans at that Aqua Teen Live show, and this is easily one of my favorite covers that you’ve ever done. I hope that your travels bring you back to the Gulf Coast (Nola, Biloxi, Mobile, PCola) sometime in the near future. Wow, just wow. I got my ticket to see you in Vancouver, so looking forward to it. Stunning and filled with incredible passion. Thank you.